Item 45R 250 JHP is a 250gr. XTP @ 2500 fps/3469 ft. lbs. Item 45R 300 JHP is a 300gr. XTP @ 2200 fps/3224 ft. lbs. Item 45R 360 HC is a 360gr. Hard Cast, FN GC @ 1850 fps/2735 ft. lbs. Both of my test guns were made by Medesha Firearms (480-986-5876) and seem to be of very high quality. Accuracy with all four loads was excellent. I had 16-inch and 20-inch barreled rifles made, to show our customers velocities from both barrel lengths. Actual velocities are posted further down in this tech write-up. This is very powerful ammo, that approaches the power levels of our +P 45-70 loads. There is no animal in America that cannot be cleanly killed with this ammunition, and frankly, I am very impressed that this type of power can be obtained through an AR10 platform. Using foot pounds of energy on big game animals that weigh much over a few hundred pounds is not very accurately gauged by using ft. lbs. of energy. Using the Taylor KO formula is a much better 'paper' formula for determining the effectiveness of ammo on large animals. Please read my short article about this in the linked tech article below. Item 45R 250 JHP is designed for critters weighing under 350 lbs. Expansion and penetration characteristics depend on bullet construction combined with the actual impact velocity and which if any bones are struck. If you shoot any living mammal at point-blank range with this bullet going this fast, (2,500 fps) the bullet will likely disintegrate, but not after penetrating around 18 inches and absolutely wreaking havoc terminally. This is the load I’d use for deer sized critters…….It will give brutal maximum tissue disruption. 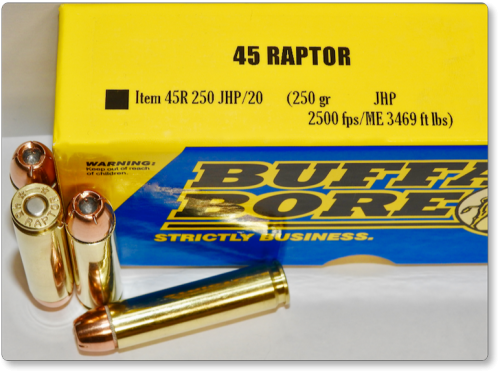 Item 45R 275 XPB is a very versatile load because the all copper bullet will penetrate quite deepl7 (well over two feet in most instances) in flesh and bone and will not disintegrate, even at point-blank range. From whitetail deer to 800 lb. bull elk, this bullet will work, nicely. Item 45R 300 JHP will do the same job as the above 275gr. 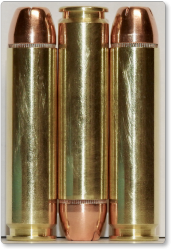 Barnes all copper bullet, but at a cheaper price and is utilizing a lead-based bullet. Item 45R 360 HCGC Flat Nose is utilizing a gas checked, hard cast (22 BHN) bullet designed not to expand and therefore, it penetrates very deep (around 4-5 feet) in flesh and bone. This bullet is gas checked and will not lead foul your barrel. This is the load I’d use for animals from the size of bull elk, up to 2,000 lb. buffalo. Due to how flat this ammo shoots combined with the .452 diameter projectiles, I see no reason not to rely on it for the purpose of protection in grizzly country, to recreational whitetail hunting, depending on ammo choice. This 360 HCGC is a very versatile cartridge.